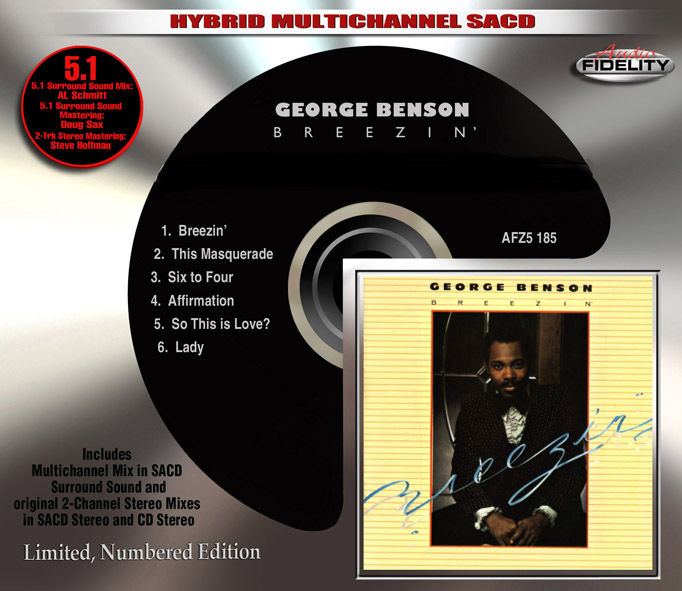 Camarillo, CA – Jazz fans worldwide are buzzing with excitement over the release of ‘Breezin’ by legendary jazz singer and guitarist George Benson on Multichannel 5.1-Surround Sound Hybrid SACD from Marshall Blonstein’s Audio Fidelity. George Benson’s ‘Breezin’ is the best-selling jazz album of all time. It is a true virtuoso performance: a four-time Grammy nominee and two-time winner, the first album by a jazz artist to earn platinum certification. Produced by Tommy Lipuma, Breezin’ features Benson with keyboardists Ronnie Foster and Jorge Dalto, rhythm guitarist Phil Upchurch, drummer Harvey Mason, bass player Stanley Banks and percussionist Ralph MacDonald. Leon Russell’s “This Masquerade” (the first song in music history to occupy the #1 spot in jazz, pop and R&B charts), featuring Benson’s soulful vocal and his trademark guitar-voice scatting technique, is the album’s only non-instrumental. The other numbers include Bobby Womack’s title song, the winner of Grammies for Record of the Year and Best Pop Instrumental. 5. So This is Love?